'husband' has been working crazy hours and is now working Saturday and Sundays. It will be like this until the movie he is working on is finished. I thought given he has been quite stressed, he would like to come home to a home cooked meal. As I had some fresh ricotta, I thought I would make my tried and tested Ricotta Gnocchi. 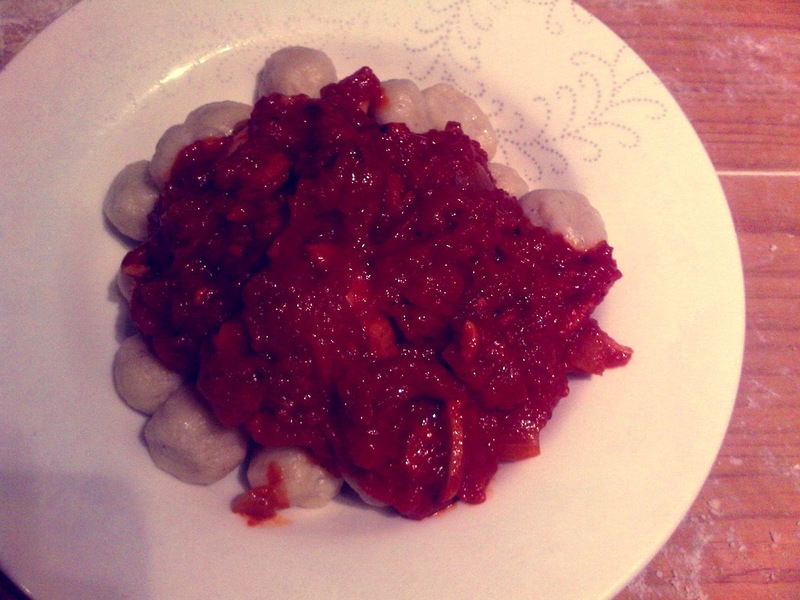 I started making this recipe when my attempt at making potato gnocchi failed dismally. As I have said before, my family are from the North of Italy, so I didn't grow up with this type of food. I thought I would share the recipe with you, the gnocchi are very easy to make and they truly are 'little balls of cheesy goodness'. 500grams of fresh ricotta, drained of excess water. I use the wonderful ricotta from Paesanella. Put a large pot of salted water on the stove and bring to the boil. Pass the ricotta through a potato ricer into a mixing bowl. Add the rest of the ingredients into the same bowl and gently mix together. 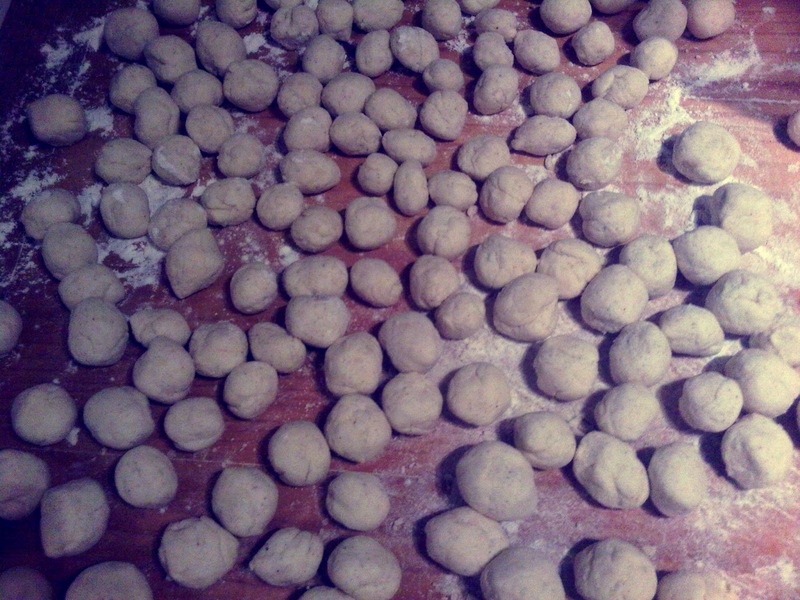 (Try not to over work the dough as the more you work it, the tougher the gnocchi become). Empty the contents of the bowl onto a floured surface. Bring a separate small saucepan of water to the boil, this is to test the gnocchi dough, to make sure the gnocchi don’t disintegrate when cooked. Remove a small piece of the dough and roll out with your fingers and make a little ball of 1cm thickness. Add this to the small boiling pan. If it disintegrates, add more flour to your dough. If not, proceed to roll the rest of the gnocchi out. 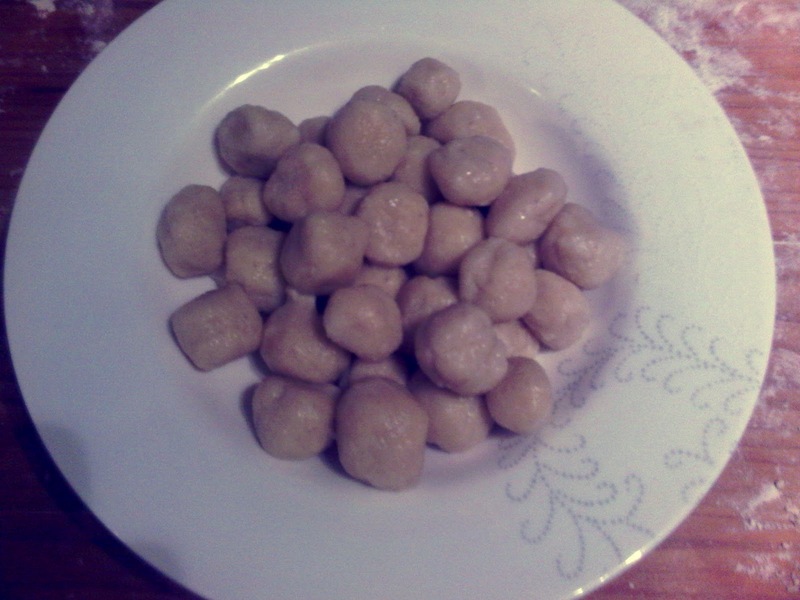 To make the gnocchi, cut the dough in small portions and roll the dough out on a lightly floured surface to about a 2cm thick/40cm long shape - it should look like a long log. Use a lightly floured knife to cut the log into 2cm long pieces. In your hands, roll the pieces into a small ball. Again try not to overwork the pasta when you do this. Place the little balls on a floured tray as you go (see pic below). In the meantime, cook the gnocchi in plenty of rapidly boiling salted water and as they come to the surface scoop them out using a perforated utensil. Then place them in the sauce or onto a plate (see picture below). This recipe serves 2 people with left overs. Note: You can double the quantities if you want to make more. I added an Amatriciana sauce to my gnocchi, but any sauce will do. A tip = Pesto goes really well with the gnocchi also. You can tell this is not a food blog, as I have no clue how to style my food when I take photos! Cant wait to try it! PS: Love the hat in your profile pic - was that in Windy Wellington?